On the site now occupied by the statue of King Charles was erected the original Queen Eleanor's Cross, a replica of whch stands in front of Charing Cross station. Mileages from London are measured from the site of the original cross. When Queen Eleanor of Castile died in 1290, Edward I commissioned twelve crosses, each at one of the stopping places on her body's procession from Lincoln to Westminster. The original cross was replaced, then demolished (the stone being re-used used to make paving along Whitehall, round the corner), and in 1863 a rather ornate version (not strictly a replica) was put up in front of Charing Cross railway station, a couple of hundred yards away. Mileage distances on road signage are still measured from this point. 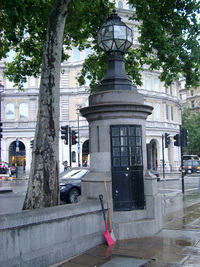 Nearby, at the South-East corner of the square, is Britain's smallest police station (says the London Encyclopedia), a phonebox-sized space inside the granite walls of a lamp post. So how many other ways can the (exact) centre of London be defined? Transport: Charing Cross station is the centre of London for Black Taxis. Piccadilly Circus is considered the centre of the Underground network (though Victoria is the busiest, and the first line ran from Farringdon to Paddington via King's Cross). London's Night bus routes all go via Trafalgar Square. Postal districts: useful explanations here and here, and history of postal systems. Roman London: The city's square mile roughly defines where Roman London stood, and there was a basilica and forum in Cornhill, dating from 70/90AD. Distances were perhaps measured in Roman London from the London Stone (if it were indeed London's "golden milestone"), which was placed in the walled city area. 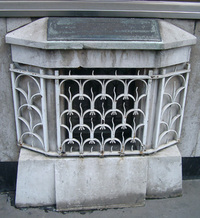 It sits today in a niche in a wall of a bank in Cannon Street. In name: Apsley House - 'No 1, London', from which London's street numbering traditionally radiates. The flow of people - commuting, shopping, socialising - multiple centres. Taxi drivers informally report that most of their journies merely enable other transport: they commonly connect railway stations to each other, or to Heathrow. Retail and finance: where are the most/highest transactions and revenue? Oxford Street? City of London for non-retail. Emotion and memory: where you were brought up. Your favourite place. The ideolocator: "You Are Here". Not all night buses go through Trafalgar Square, although the introduction of "24 hour routes" rather than N-prefixed routes does confuse people trying to find this sort of thing out. Off the top of my head, though, the N19 and N271 don't go to Trafalgar Square. Well, *I* didn't know about the smallest police station. But now I do, thanks to Rodcorp! Anyway I digress. I really wanted to say that the link to comments on Ben Hammersley's site http://www.benhammersley.com/archives/004761.html isn't working. I'd be very happy if you could point me towards the comments you mentioned, because I have a deep and longstanding interest in the centres of continents. I know where the nose is! If you travel up the Mall as if by car it is on the central support at about 2.5m above the road. It is lifesize, but I have no idea of the history behind it. Does anybody know where abouts nancys steps are located, I have an idea it may be round abouts the london bridge? So which is it? are distances measured from Charing Cross or King Charles' staute. I am a tour guide and have always been told it was in trafalgar square. You correctly point out that my post is a bit confusing on the location! I think you're right: Trafalgar Square. It's a couple of years since I wrote that so the memory grows brittle, but I'm pretty sure that the mileages are measured from the *original site* of the cross - ie: where that plaque is at the foot of the King Charles statue at the bottom of Trafalgar Sq - rather than from the replica cross just outside Charing Cross station. "When Queen Eleanor of Castile died in 1290, Edward I commissioned twelve crosses, each at one of the stopping places on her body's procession from Lincoln to Westminster. The original cross was replaced, then demolished (the stone being re-used used to make paving along Whitehall, round the corner, and in 1863 a rather ornate version - not strictly a replica - was put up in front of Charing Cross railway station, a couple of hundred yards away); [however, despite the cross's demolition,] mileage distances on road signage are still measured from this point." interesting little discussion. i know of a few more 'secret police stations' in london though. according to this site -- http://www.londondrum.com/ -- the rooms inside wellington arch used to house a small police station. (although compared to the one in trafalgar square it was positively spacious!) and the three narrow rooms inside marble arch once acted as a staging post for coppers to come running out at the height of the hyde park riots. Check this out for a small police station ! I'd like to think that the small, secret police stations are staffed only by small, secretive police officers.